← Why are John 7:53—8:11 doubted in many modern Bible translations? This image is a representation of the image that King Nebuchadnezzar saw in his dream that was interpreted by Daniel and is found in the prophecy of the book of Daniel Chapter 2. All of that prophecy has already been fulfilled except the last part, which describes a “stone that smote the image” on the toes, because of chronology (time is illustrated running from the head to the toes) and the stone “became a great mountain, and filled the whole earth.” The period when this happens is in the latter days when Christ returns. The “great mountain” represents His kingdom on earth. Daniel 2:42,43 And as the toes of the feet were part of iron, and part of clay, so the kingdom shall be partly strong, and partly broken. 43 And whereas thou sawest iron mixed with miry clay, they shall mingle themselves with the seed of men: but they shall not cleave one to another, even as iron is not mixed with clay. Today the toes remain in the governments of man, both strong (iron) and weak (clay). It has been suggested, by various Bible commentators, that the “iron” governments are found in communist and fascist type dictatorships (China, North Korea, Saudi Arabia, Iran etc), while “clay” governments are found in democracies (USA, UK, Australia etc). On June 1st while talking about the iron and clay of Daniel chapter two to a friend, he replied, “the clay is covering the iron!” I suddenly saw the iron and the clay in a new light! All democratic governments have an iron dictatorial core which the common people do not see! They can’t see it because it is hidden behind the democratic process, the clay which covers the iron control of the elite! 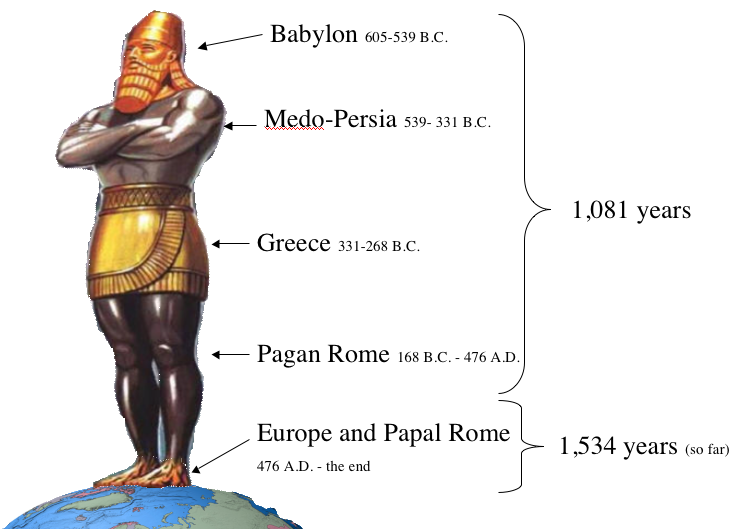 According to the symbolism of the stature, the modern-day nations now represented by the 10 toes (with 3 broken) should be the extenuation of the European nations that conquered the pagan Roman empire. This means that even though these final nations are ostensibly democracies, in reality they are nations controlled by a ruling elite from within–a secret (or shadow) government. That control, though hard to clearly see, leads back to Rome. Imagine, if you will, in this image in the right, the legs are iron, representing Rome in both its pagan and Christianised forms (papal Rome), but the iron extends into the skeletal bones under the flesh. This is “iron mixed with clay,” which symbolically could represent the so-called democracies in the European Union, though actually they are ruled by a shadow government. It is not uncommon to read in the press complaints from people stating how their sovereign laws are bypassed by dictates from the centralised European law-makers, who are from the perspective of their people are unelected. This is also true of the UN, which makes laws over sovereign nations, where the people of those nations have no say. This notion of iron covered by clay presents a new interpretation for the toes in Daniel 2, one that I believe is really worth considering. This entry was posted in Bible prophecy and tagged Daniel, Daniel 2 prophecy, Daniel chapter, image of Daniel 2, iron and clay, Jesus Christ, John Hartnett, Papacy, Roman Catholic Church, the book of Daniel, toes. Bookmark the permalink.